Bake the bacon on a cookie sheet in a 350 degree oven, flipping once, and taking out the bacon once the meat is cooked but not very crispy. Cut up the sweet potatoes, sprinkle with salt and pepper, drizzle on the bacon grease, and cook in the 350 degree oven until the potatoes are soft and moderately brown. Pour off any excess grease. 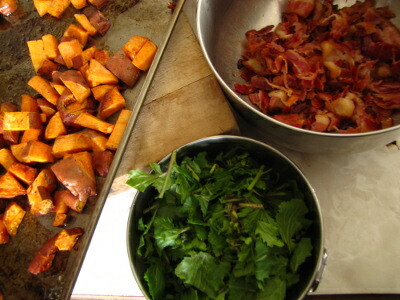 Meanwhile, break the bacon into pieces, then go out into the garden and cut a cup or two of whatever greenery you have on hand. In the fall, we use a lot of green onions, but our Egyptian onions have slowed down for the winter, so this time around we mostly used arugula. Whatever you choose, cut it up into one inch pieces. 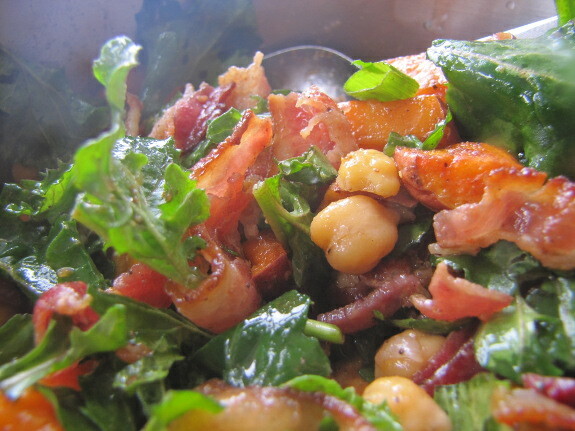 Mix the bacon, sweet potatoes, greens, and chickpeas together, put on a few dashes of balsamic vinegar (start slow --- you don't need much), and add salt and pepper to taste. Serves about eight to ten, especially if you have a green salad on the side. Our chicken waterer keeps the flock hydrated summer and winter with copious, clean water.